From the moment my mother pulled away, at the age of 12, as I stared out of the academy’s motel window with tears streaming down my face, I began my intimate relationship with loneliness—an experience we all face from time to time as a competitive tennis player. Now, just for the record, let me be clear about my belief regarding this pervasive quest. Winning does feel very fulfilling. It is also an important barometer to measure our progress and hard work. Winning creates tension but it also makes the game exciting. For some, it earns them a living. Clearly, it has its place. However, it’s my strong belief that the final frontier toward truly fearless tennis lies in our ability to balance its polar opposite—losing. We’ve all witnessed people who have lost and have felt it ourselves. Let’s face it; we know the feeling of playing “not to lose.” We have found ourselves protecting against this mini-tragedy, its pain, the ensuing loneliness of it, even projected ourselves into the future, post-match assault, “Did you win?” again and again. The words are played over and over again, “I could have, if only, what if….” If we’re honest, most of us experience great pain in this mind-set, one that has caused me heartache and contributed to sub-par performances throughout my own career. There is a great deal of anguish and pain in this when winning is used to bolster our self-esteem, even our plight in life. Believe me, the line can get awfully blurry sometimes. And few other sports bring out this anxiety like tennis. In baseball and football, you have the team to take comfort in. Golf is played against the course. But tennis is combative, not unlike boxing. You’re out in the open, alone and very much exposed, there really is no place to hide. It can be one-on-one assault on the ego and that’s what brings out the negativity and frustration and makes losing so painful. But it’s also what makes tennis such a great game. We can all relate to the tension that creeps in while leading—God forbid we should actually squander a lead and lose—because the pain here is that much worse. After all, we were almost “there”—we were so close. I have to continually re-align myself to the right perspective because I, too, know the pain in the short-term, very narrow-minded frame of mind. Take my match against Scott Draper, a top 50-player for a number of years (he just reached the 3rd round of Wimbledon for the second year in a row). Two years ago at the Siebel Open in the first round of qualifying, I was serving for the match at 5-3 in the third set. Here, I let up for just a moment—enough for a top player like this to inch his way back—and ended up losing 7-5 in the third. Suffice it to say, my experience and memory of this match now creates more joy than despair. The key is for us to get to that second thought. Feeling the pain of the loss for a short time to get the lesson can be key, but once you’ve got it, move on quickly. Otherwise, this is where the pain and anguish lie. In my private practice often what I find my clients (competitive league players, juniors, college players, even pros) experiencing after a loss are disappointment in a “lost opportunity,” frustration and anger of not performing to their expectations, diminished self-worth, and a blow to their self-image. Many club players, for example, feel enormous social pressure to win—for themselves and the team—to maintain a positive image and opinion by others. This pressure “chamber” is reinforced constantly and is the unspoken distraction and fear that is the cause of many performance failures. 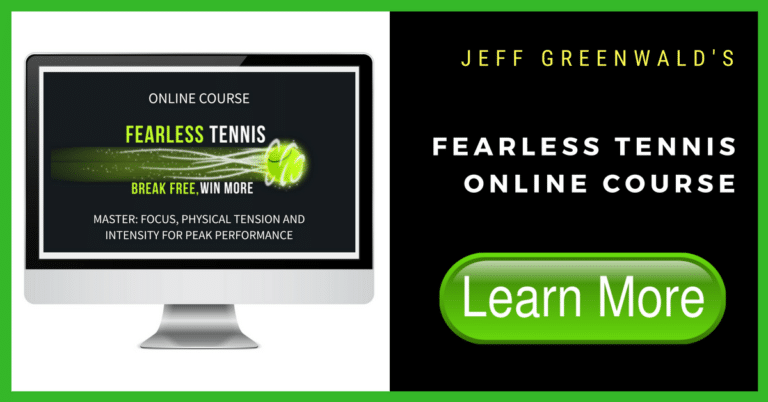 This external pressure coupled with our own personal need to succeed and be worthy creates an even more tension-filled environment than many pros deal with. Top pros have learned to manage these potential external distractions by focusing more on what they have control over. Image among peers and self-worth are “irrelevant” during match play. Club players need to realize this reality more and more if they want to break out of this pressure-filled chamber and illusion that winning will buy them more self-worth. The truth is, the more success you have the more you need to keep the image alive. In this system, we’re never free. While all of these reactions are seemingly normal given our attachment to success as a reflection of who we are, they create tremendous tension, anxiety and diminished enjoyment in the game. This layer of “baggage”, which has been created out of our attachment and unconscious need to feel worthy and receive external validation, causes us to play in fear and actually sabotages our success in the long run. Many elite athletes have seemed to find an inner drive and determination—and, incidentally, a strong distaste for losing—that have driven them to greater heights. It’s my belief that the supremely talented can do this successfully. They can train harder, maintain a single-minded focus on their goal—often bordering obsession—and ultimately achieve, even win more. Letting go of this attachment is definitely a process of understanding how much pressure we’re placing on ourselves, the inner dialogue that is running in the moment, and getting to a point of wanting to try something new. Wanting to experience the game on a different level—one that is primarily associated with feeling good and playing fearlessly—is mandatory for this shift to take place. In other words, whether we miss the ball, even lose, but go for our shots under pressure and manage our emotions in the moment, we will win the longer battle–reaching our full potential. For most of us, the pain, the loneliness, and self-defeating behavior (negativity, frustration, anger, tentative play) only keep us stuck. We may work harder and even experience the illusion of progress in our practice sessions, but we will continually be haunted when it counts most. Out of our fear of losing comes the loss of the “process”—all the aspects of the performance that actually help us win more. The answer, from my perspective, as I continue to learn day after day, resides in our courage to stare at this bogie man in the face. When we accept losing as a possibility, embrace the tension between its brother, winning, without hiding, protecting, fearing, and shrinking from the moment before us, we will be free. For me, much of my personal breakthrough over the past few years that has taken my game to its highest level ever is this more balanced perspective on winning and losing. I no longer need to protect and play so conservatively because I accept the consequences of my actions. I have prioritized the feeling of hitting the ball and the joy this brings me over the result, which has made all the difference. Either way, I am convinced that if we can all continue to move deeper into a state of mind and body that exists beyond the result of our efforts from shot-to-shot, we will find more joy than ever before. The lonely edge we once knew so intimately will finally be smoothed out. Ironically, once we do this, we’ll actually win more…. Victor Frankl, in Man’s Search for Meaning had this to say about freedom, “The definition of freedom is feeling as though you have nothing to lose.” Ultimately, when our deepest vision shifts toward a greater desire to go for our shots, playing authoritatively under pressure, and relishing every shot and the drama beyond simply the win or loss, we will be free. In other words, I have learned to thrive more on the “process” of competition and challenging myself to compete at my highest level. I now respect and cherish each opportunity before me – producing my best under pressure, staying focused on the task regardless of the circumstance, rising up to the challenges presented to me. This does not mean that results no longer matter…but the moment-by-moment experience and thrill of challenging myself plays the larger role. What does this look like in action? We carry ourselves more confidently. We worry less and focus more on what is “relevant” in the moment. We focus on the ball like never before. We breathe. We stay connected to our body and get out of our head. We trust. We have fun. We love hitting the ball. We’re clear about our strategy and have courage to execute it at will. There are often many roads to the same destination. Perhaps shifting to the perspective of thriving more on the pressure before us at any given moment, truly embracing this opportunity with the most courageous aspect of ourselves to play the right shot at the right time is the answer. Perhaps part of this process is merely to come to terms with our fear of losing and what this really means to us is the answer to finally freeing ourselves from the grips of these polar opposites.